This giant chocolate chip cookie is simple to make, contains no flour, takes a few mins to make and most importantly tastes delicious. It has such a great texture and taste that most people wouldn’t guess how easy it is to make. It’s healthy, vegan, plant based and can be made in a rush. 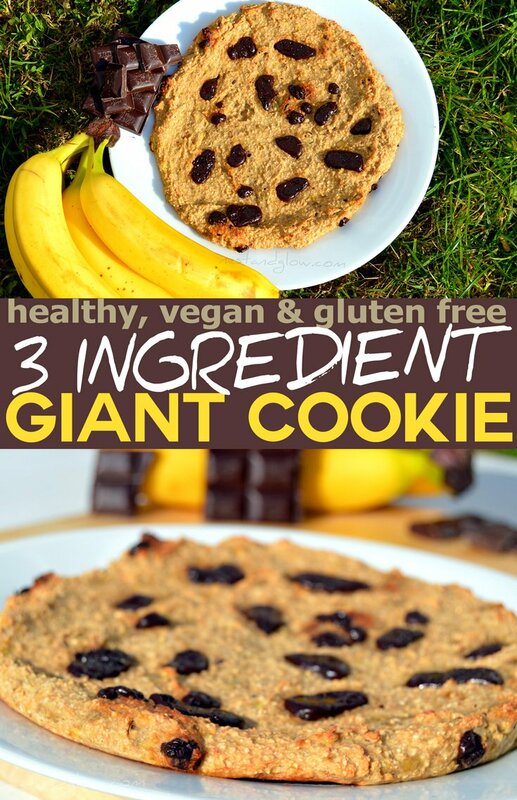 It may contain over a thousand calories, but it is a giant cookie! One person would struggle to eat it all as it’s very filling with all the oats and fruit. Easily one-quarter of this feels like you’ve had a lot. It’s just the right size to feed a family or a group of four. I like to use a very dark 85% chocolate to make this, the bitterness of the dark chocolate works really well with the sweet bananas. You can use whatever chocolate you like, but a dark chcocolate is usually dairy free so is safe for vegans to eat, but do check each brand. Just chop up a block of chocolate to make chocolate chips from your favorite bar. 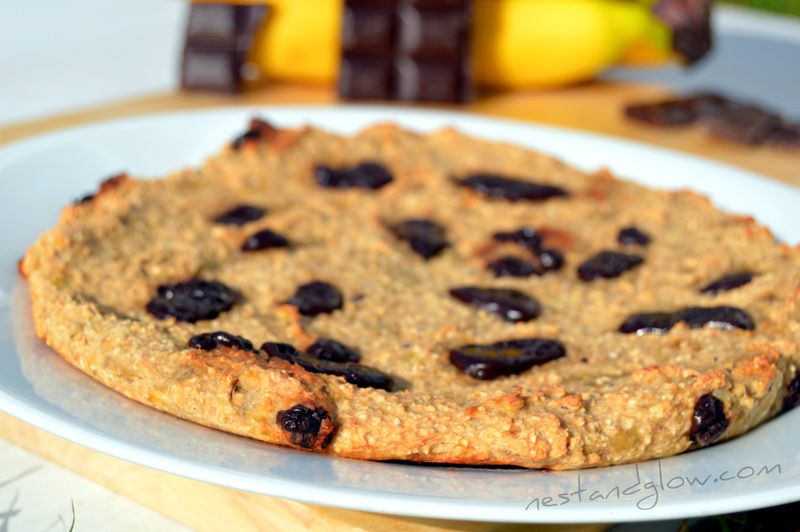 Remember to use gluten free oats if you are making this for someone that avoids gluten. Grind the oats for a few seconds to make an oat powder. Peel the bananas and then mash them. Mix everything together until combined. Spoon onto a non stick sheet and spread out to make a giant cookie shape. Bake for 15-20 mins until golden at 350°F / 180 °C. If you want a chewier cookie take out of the oven as it starts to get some colour, for a crunchier cookie leave until it’s golden brown. Sprinkle on a few more chocolate chips (optional). As it has fresh banana it will go off quickly so it’s best to eat straight away. Can be stored for a few days in the fridge but will loose the crunch.